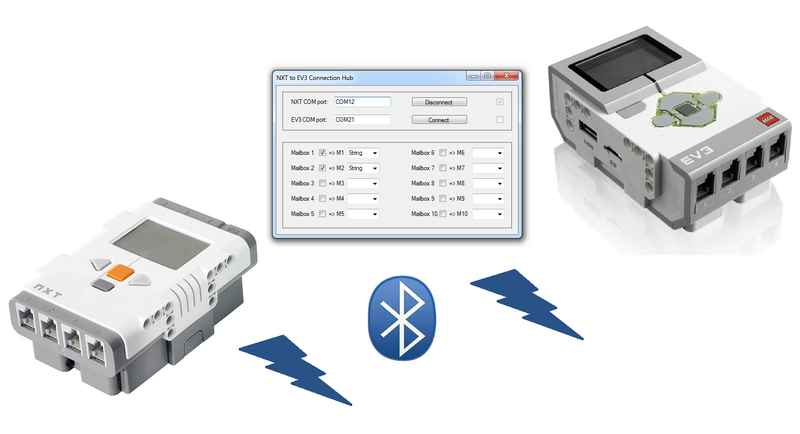 I’m working on a simple PC application to make it possible to use the NXT brick as an EV3 remote control. The mailbox mechanism is different for the two bricks, the PC application is therefor needed to convert the messages from the NXT format to the EV3 format. By this means, you can send messages (e.g. if you press a button at the NXT) to the EV3 (e.g. to control a motor). 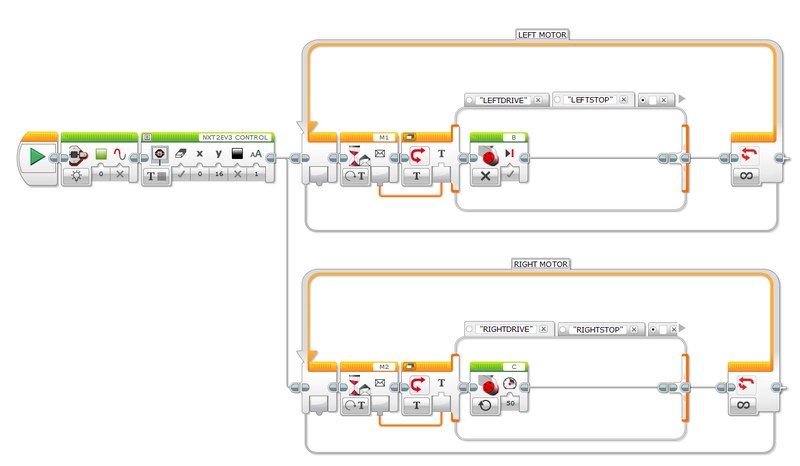 A simple test version is already working: using two buttons at the NXT to control two motors at the EV3. Can you help me on receiving messages on the PC from NXT in VB.NET ? Yes, of course. Will send you a Dropbox link. 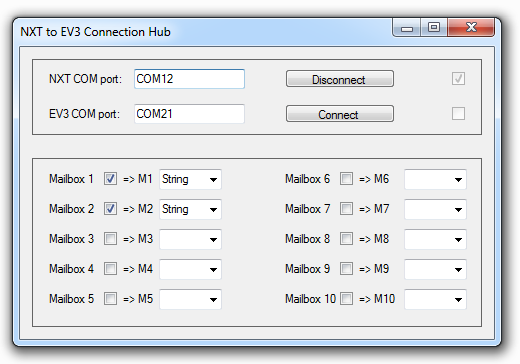 Any news about your NXT==>EV3 Bth comunication SW ?. Can I have a beta ? Sorry, no news yet. I have been very busy the last months (work, work, work). Therefore, I didn’t manage to work on the NXT2EV3 Hub. I’m afraid you have to be patient…. Can I have the link too? Yes, you can. Will send you the Dropbox link as well. Could I please have a download link for the software? I need it or something similar urgently. Of course you can. I will send you a copy via Dropbox. May I download the software too ? just to understand how can I adapt it to my purpose. Of course you may download it too. I will send you the needed Dropbox location. Of course you can. Will send you the link via Dropbox. Hello! May I have a download link too? Will send you the link via Dropbox. I have the same problem as Carlo. I can’t receive the message from NXT. Can you help me on it? I’m working on the bluetooth connection between NXT and PC. I have the same prolem as Carlo. I can’t receive the message from NXT. I have no problems with sharing my code, but I don’t have the time to give support. Sorry for that. Next, your description “I can’t receive the message” is a very vague. Can be numerous reasons that causes the problem. And for you as well: sorry for the delay. I’ll send you a Dropbox link to the software. Sure, no problem. Will send it to you. Of course, I will send you the source by email. can you send to ammariskandarbinnorhisham@yahoo.com? What would you like me to send? Could you please send me the software too? Hi, I was wondering if I could have a download. Thanks! Yes, you can. I will send you a Dropbox link. could you send me the software via email: duuuydog@icloud.com Thanks! Yes, I can. Will send you a Dropbox link. Hello Hans, my kids and me are having the same problem… One NXT and one EV3 trying to get them to communicate. Is it possible to request another dl link for your bluetooth proxy please? Of course you can have also the Dropbox link. Will send it to you. Thank you Hans! Built the solution in VS2013 and started it, no errors so far… Will try it from the play-laptop with the bricks tonight. You’re very welcome. Please let me know if you have any problems. Hello, I was wondering if I could have a download. I will send you the download link as well. Thank you Hans, means a lot. could you send me the programme? Of course, will send you the Dropbox link as well. Can i have link too? Just send to me via email at a.eigner73@gmail.com or mabye you cud just post an acual link and that will be easier so you wont need to keep sending it ty in advanced. Could you send me the programme using email? can i get the link?? Yes, of course you can. I’ll send you the link as well. may I have it as well? Yes, you can. I’ve just send you the Dropbox link. Well, I see it’s been awhile since you’ve had activity on this thread. But alas I now also have need to control an EV3 with an older NXT brick. May I be so bold as to ask you to once again share your hub software with me so that I can use my laptop (Windows 10) as the connection. I was rather busy the last months, that’s why I didn’t do much on this blog. Most of the updates, I do nowadays at Eurobricks. Of course you can get the sources, however I don’t know if it will work on Windows 10. Sioux .NET on Track is one of the expertisegroups of Sioux Embedded Systems in Eindhoven. We are a group of enthusiastic colleagues who come together after working hours to get experience with Microsoft.NET. To make learning fun, we develop an application in C# for making a full automated Lego train layout, using Lego Mindstorms and Lego Power functions.